(Trent Nelson | The Salt Lake Tribune) Utah Jazz center Rudy Gobert (27) as the Utah Jazz host the Phoenix Suns, NBA basketball in Salt Lake City on Monday March 25, 2019. 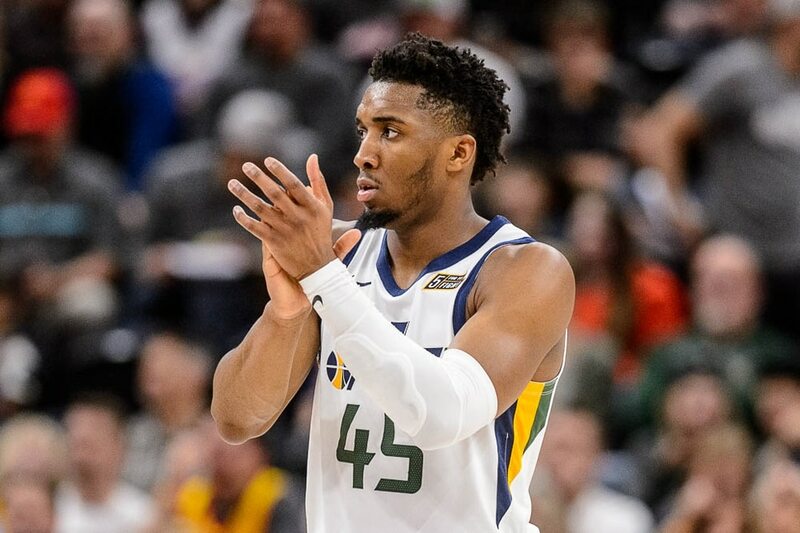 (Trent Nelson | The Salt Lake Tribune) Utah Jazz guard Donovan Mitchell (45) as the Utah Jazz host the Phoenix Suns, NBA basketball in Salt Lake City on Monday March 25, 2019. (Trent Nelson | The Salt Lake Tribune) Phoenix Suns guard De'Anthony Melton (14) knocks the ball away from Utah Jazz guard Ricky Rubio (3) as the Utah Jazz host the Phoenix Suns, NBA basketball in Salt Lake City on Monday March 25, 2019. (Trent Nelson | The Salt Lake Tribune) Utah Jazz forward Joe Ingles (2) drives on Phoenix Suns guard Jimmer Fredette (32) as the Utah Jazz host the Phoenix Suns, NBA basketball in Salt Lake City on Monday March 25, 2019. 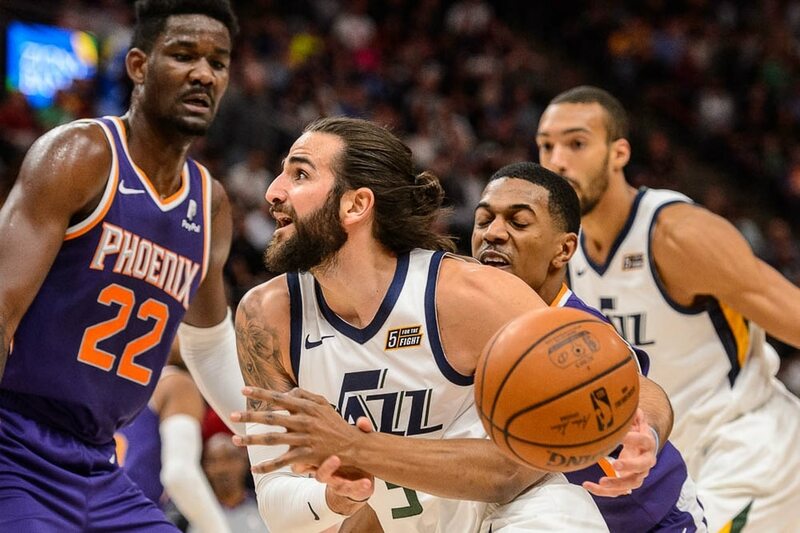 (Trent Nelson | The Salt Lake Tribune) Utah Jazz guard Ricky Rubio (3), Phoenix Suns guard De'Anthony Melton (14) as the Utah Jazz host the Phoenix Suns, NBA basketball in Salt Lake City on Monday March 25, 2019. (Trent Nelson | The Salt Lake Tribune) Utah Jazz guard Kyle Korver (26) as the Utah Jazz host the Phoenix Suns, NBA basketball in Salt Lake City on Monday March 25, 2019. (Trent Nelson | The Salt Lake Tribune) Phoenix Suns forward Ray Spalding (26), Utah Jazz forward Derrick Favors (15), Phoenix Suns forward Richaun Holmes (21) as the Utah Jazz host the Phoenix Suns, NBA basketball in Salt Lake City on Monday March 25, 2019. (Trent Nelson | The Salt Lake Tribune) Utah Jazz forward Joe Ingles (2) drives on Phoenix Suns guard Troy Daniels (30) as the Utah Jazz host the Phoenix Suns, NBA basketball in Salt Lake City on Monday March 25, 2019. (Trent Nelson | The Salt Lake Tribune) Phoenix Suns guard Jimmer Fredette (32) as the Utah Jazz host the Phoenix Suns, NBA basketball in Salt Lake City on Monday March 25, 2019. (Trent Nelson | The Salt Lake Tribune) Utah Jazz forward Derrick Favors (15) drives on Phoenix Suns forward Richaun Holmes (21) as the Utah Jazz host the Phoenix Suns, NBA basketball in Salt Lake City on Monday March 25, 2019. (Trent Nelson | The Salt Lake Tribune) Utah Jazz forward Jae Crowder (99) as the Utah Jazz host the Phoenix Suns, NBA basketball in Salt Lake City on Monday March 25, 2019. (Trent Nelson | The Salt Lake Tribune) Utah Jazz forward Jae Crowder (99) as the Utah Jazz host the Phoenix Suns, NBA basketball in Salt Lake City on Monday March 25, 2019. (Trent Nelson | The Salt Lake Tribune) Phoenix Suns guard Jimmer Fredette (32) as the Utah Jazz host the Phoenix Suns, NBA basketball in Salt Lake City on Monday March 25, 2019. (Trent Nelson | The Salt Lake Tribune) Utah Jazz head coach Quin Snyder as the Utah Jazz host the Phoenix Suns, NBA basketball in Salt Lake City on Monday March 25, 2019. (Trent Nelson | The Salt Lake Tribune) Phoenix Suns guard Devin Booker (1) shoots over Utah Jazz center Rudy Gobert (27) as the Utah Jazz host the Phoenix Suns, NBA basketball in Salt Lake City on Monday March 25, 2019. (Trent Nelson | The Salt Lake Tribune) Phoenix Suns guard Devin Booker (1) shoots over Utah Jazz guard Ricky Rubio (3) as the Utah Jazz host the Phoenix Suns, NBA basketball in Salt Lake City on Monday March 25, 2019. (Trent Nelson | The Salt Lake Tribune) Utah Jazz center Rudy Gobert (27) gets tangled up with Phoenix Suns guard Devin Booker (1) as the Utah Jazz host the Phoenix Suns, NBA basketball in Salt Lake City on Monday March 25, 2019. (Trent Nelson | The Salt Lake Tribune) Phoenix Suns guard Jimmer Fredette (32) misses a shot, defended by Utah Jazz forward Royce O'Neale (23) and Utah Jazz center Ekpe Udoh (33) as the Utah Jazz host the Phoenix Suns, NBA basketball in Salt Lake City on Monday March 25, 2019. (Trent Nelson | The Salt Lake Tribune) Phoenix Suns guard Devin Booker (1) drives to the basket ahead of Utah Jazz forward Derrick Favors (15) as the Utah Jazz host the Phoenix Suns, NBA basketball in Salt Lake City on Monday March 25, 2019. (Trent Nelson | The Salt Lake Tribune) Phoenix Suns guard Jimmer Fredette (32) puts up a shot over Utah Jazz guard Raul Neto (25) as the Utah Jazz host the Phoenix Suns, NBA basketball in Salt Lake City on Monday March 25, 2019. (Trent Nelson | The Salt Lake Tribune) Utah Jazz forward Jae Crowder (99) celebrates a basket as the Utah Jazz host the Phoenix Suns, NBA basketball in Salt Lake City on Monday March 25, 2019. (Trent Nelson | The Salt Lake Tribune) Phoenix Suns guard Devin Booker (1) shoots with Utah Jazz forward Derrick Favors (15) defending, as the Utah Jazz host the Phoenix Suns, NBA basketball in Salt Lake City on Monday March 25, 2019. (Trent Nelson | The Salt Lake Tribune) Phoenix Suns guard Jimmer Fredette (32), defended by Utah Jazz guard Raul Neto (25) as the Utah Jazz host the Phoenix Suns, NBA basketball in Salt Lake City on Monday March 25, 2019. (Trent Nelson | The Salt Lake Tribune) Phoenix Suns guard Jimmer Fredette (32) is knocked to the court as the Utah Jazz host the Phoenix Suns, NBA basketball in Salt Lake City on Monday March 25, 2019. (Trent Nelson | The Salt Lake Tribune) Utah Jazz forward Jae Crowder (99) as the Utah Jazz host the Phoenix Suns, NBA basketball in Salt Lake City on Monday March 25, 2019. (Trent Nelson | The Salt Lake Tribune) Phoenix Suns guard Jimmer Fredette (32) as the Utah Jazz host the Phoenix Suns, NBA basketball in Salt Lake City on Monday March 25, 2019. (Trent Nelson | The Salt Lake Tribune) Phoenix Suns guard Jimmer Fredette (32), before scoring his first point, a free throw, as the Utah Jazz host the Phoenix Suns, NBA basketball in Salt Lake City on Monday March 25, 2019. (Trent Nelson | The Salt Lake Tribune) Phoenix Suns guard Jimmer Fredette (32) looks into the crowd after missing multiple shots, as the Utah Jazz host the Phoenix Suns, NBA basketball in Salt Lake City on Monday March 25, 2019. (Trent Nelson | The Salt Lake Tribune) Utah Jazz center Rudy Gobert (27) dunks as the Utah Jazz host the Phoenix Suns, NBA basketball in Salt Lake City on Monday March 25, 2019. (Trent Nelson | The Salt Lake Tribune) Phoenix Suns forward Richaun Holmes (21) reacts to being ejected from the game as the Utah Jazz host the Phoenix Suns, NBA basketball in Salt Lake City on Monday March 25, 2019. (Trent Nelson | The Salt Lake Tribune) Phoenix Suns guard Devin Booker (1) defended by Utah Jazz forward Royce O'Neale (23) as the Utah Jazz host the Phoenix Suns, NBA basketball in Salt Lake City on Monday March 25, 2019. (Trent Nelson | The Salt Lake Tribune) Phoenix Suns guard Jimmer Fredette (32), defended by Utah Jazz guard Raul Neto (25) as the Utah Jazz host the Phoenix Suns, NBA basketball in Salt Lake City on Monday March 25, 2019. (Trent Nelson | The Salt Lake Tribune) Phoenix Suns guard Jimmer Fredette (32) as the Utah Jazz host the Phoenix Suns, NBA basketball in Salt Lake City on Monday March 25, 2019. (Trent Nelson | The Salt Lake Tribune) Utah Jazz center Rudy Gobert (27) rebounds as the Utah Jazz host the Phoenix Suns, NBA basketball in Salt Lake City on Monday March 25, 2019. (Trent Nelson | The Salt Lake Tribune) Utah Jazz head coach Quin Snyder as the Utah Jazz host the Phoenix Suns, NBA basketball in Salt Lake City on Monday March 25, 2019. (Trent Nelson | The Salt Lake Tribune) Phoenix Suns guard Elie Okobo (2) looks to pass, defended by Utah Jazz center Rudy Gobert (27) as the Utah Jazz host the Phoenix Suns, NBA basketball in Salt Lake City on Monday March 25, 2019. (Trent Nelson | The Salt Lake Tribune) Phoenix Suns guard Jimmer Fredette (32) as the Utah Jazz host the Phoenix Suns, NBA basketball in Salt Lake City on Monday March 25, 2019. (Trent Nelson | The Salt Lake Tribune) Phoenix Suns guard Devin Booker (1) drives to the basket ahead of Utah Jazz forward Derrick Favors (15) as the Utah Jazz host the Phoenix Suns, NBA basketball in Salt Lake City on Monday March 25, 2019. (Trent Nelson | The Salt Lake Tribune) Phoenix Suns center Deandre Ayton (22) as the Utah Jazz host the Phoenix Suns, NBA basketball in Salt Lake City on Monday March 25, 2019. (Trent Nelson | The Salt Lake Tribune) Phoenix Suns guard Jimmer Fredette (32) looks into the crowd after missing multiple shots, as the Utah Jazz host the Phoenix Suns, NBA basketball in Salt Lake City on Monday March 25, 2019. (Trent Nelson | The Salt Lake Tribune) Utah Jazz center Rudy Gobert (27) dunks as the Utah Jazz host the Phoenix Suns, NBA basketball in Salt Lake City on Monday March 25, 2019. (Trent Nelson | The Salt Lake Tribune) Phoenix Suns guard De'Anthony Melton (14) pulls down a loose ball ahead of Utah Jazz forward Joe Ingles (2) as the Utah Jazz host the Phoenix Suns, NBA basketball in Salt Lake City on Monday March 25, 2019. (Trent Nelson | The Salt Lake Tribune) Utah Jazz forward Jae Crowder (99) as the Utah Jazz host the Phoenix Suns, NBA basketball in Salt Lake City on Monday March 25, 2019. (Trent Nelson | The Salt Lake Tribune) Utah Jazz center Rudy Gobert (27) dunks as the Utah Jazz host the Phoenix Suns, NBA basketball in Salt Lake City on Monday March 25, 2019. (Trent Nelson | The Salt Lake Tribune) Phoenix Suns guard Jimmer Fredette (32) surrounded by defenders as the Utah Jazz host the Phoenix Suns, NBA basketball in Salt Lake City on Monday March 25, 2019. (Trent Nelson | The Salt Lake Tribune) Phoenix Suns guard Jimmer Fredette (32) drives on Utah Jazz guard Raul Neto (25) as the Utah Jazz host the Phoenix Suns, NBA basketball in Salt Lake City on Monday March 25, 2019. (Trent Nelson | The Salt Lake Tribune) Phoenix Suns guard Jimmer Fredette (32) looks into the crowd after missing multiple shots, as the Utah Jazz host the Phoenix Suns, NBA basketball in Salt Lake City on Monday March 25, 2019. (Trent Nelson | The Salt Lake Tribune) Utah Jazz forward Georges Niang (31) reaches down at the ball, held by Phoenix Suns guard Jimmer Fredette (32) as the Utah Jazz host the Phoenix Suns, NBA basketball in Salt Lake City on Monday March 25, 2019. (Trent Nelson | The Salt Lake Tribune) Utah Jazz center Rudy Gobert (27) gets tangled up with Phoenix Suns guard Devin Booker (1) as the Utah Jazz host the Phoenix Suns, NBA basketball in Salt Lake City on Monday March 25, 2019. (Trent Nelson | The Salt Lake Tribune) Utah Jazz center Ekpe Udoh (33) knocks down a shot by Phoenix Suns guard Jimmer Fredette (32) as the Utah Jazz host the Phoenix Suns, NBA basketball in Salt Lake City on Monday March 25, 2019. At left is Utah Jazz guard Raul Neto (25). As a guard at BYU, Jimmer Fredette led the Cougars to national prominence by leading the nation in scoring. As a senior, he wound up winning National Player of the Year honors, and eventually became an NBA lottery pick, and one of the most celebrated basketball figures ever to grace the state of Utah. His NBA career never quite reached the same heights, however. Less than three years after being a draft-night acquisition of the Sacramento Kings, he was waived. Over the next few seasons, he got some limited opportunities — 54 games with the Pelicans, eight with the Bulls, two with the Knicks — but never managed to stick. In 236 career NBA games, he’s averaged just 6.0 points on 41.1 percent shooting. After a stint in the G League, Fredette went overseas and carved out a nice living for himself, playing the last three years with the Chinese Basketball Association. Still, fans of his have always maintained he deserved another shot at the NBA. And he never gave up hoping for one. Once the Chinese league’s most recent season ended, and he became eligible to sign with an NBA team, the Phoenix Suns decided to give him that opportunity — signing him for the remainder of the 2018-19 season, with a team option for next season. The 30-year-old Fredette made his NBA return on Saturday in Sacramento against the Kings — his first NBA organization, which wasn’t lost on him. He played only four minutes and went scoreless, missing a 3-pointer (his only shot of the game). He did grab two rebounds. While he likened getting back out there to “riding a bike,” he also acknowledged the difficulty of going up against top competition. Then again, that was the idea behind coming back in the first place. The Triple Team: Devin Booker scored 59 in a myriad of ways, does that worry the Jazz? Plus thoughts on Rubio and Jimmer’s play in a 33-point Jazz win. 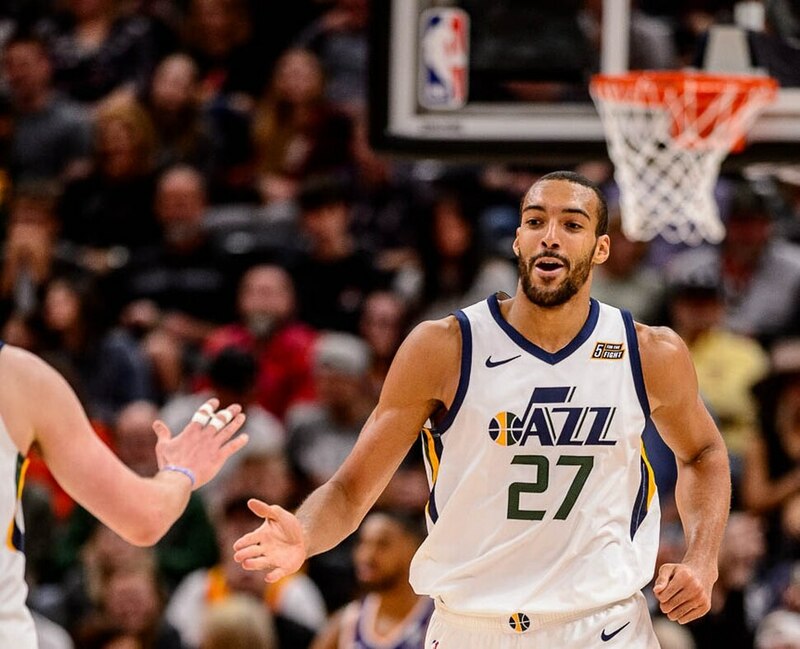 Jazz are 25-10 in the second half of the NBA season; is this team as good as last year’s? The results didn’t necessarily show in his second game back, against a tough defensive opponent in the Jazz, but in front of an adoring audience. He scored six points Monday night, albeit on 1-for-10 shooting from the field and four made free throws. Still, he said after the game, while he was frustrated with his shooting, he couldn’t help but appreciate the experience. Jazz forward Kyle Korver, meanwhile, said that you couldn’t help but notice the crowd’s reaction to Fredette and appreciate his path in getting back.